The world of financial services is broad and it is good to have a good understanding of the overall picture. Today I am breaking it down for you AND I am providing you tons of resources so make sure you go to today’s show notes on the website so you don’t miss out. Wealth Building: Financial Advisors, Financial Planners, Robo Advisors. ‘Financial Advisor’ is a broad term used to describe individuals that help others with their finances. A Financial Planner is a specific type of financial advisor. Robo Advisors are automatic services which provide personal finance based on the data you provide. Financial Wellness/Education: Financial Coaches, Financial Counsellors, Financial Therapists. A Financial Coach is anyone with a heart or passion towards finances. Financial coaching is not a regulated field. Financial Counsellors aren’t regulated like Financial Advisors, but they must maintain ethical standards from AFCPE. Financial therapy was founded in 2010, and deals with traumatic events pertaining to finances. Banking and Money Management: This is pretty much self-explanatory. Borrowing: Using a credit card, loans, student loans, managing debt. Credit: Credit score, credit bureaus, credit repair. Services that help repair credit. Find a FREE resource from the FTC on how to repair your credit in the resource area. NOTE: Nonprofit does not mean credible. Taxes: IRS, accountants, tax filing businesses. Wealth Protection: Insurance, state planning, wills, etc. The legal documents you may or may not have that you should have. Convenience services: Pawn shops, predatory lenders. Services you need to stay away from. They are convenient, but come with high prices: very steep fees. Consumer protection services: Consumer Financial Protection Bureau (federal), State Consumer Protection Offices (state). Where you go to check the organizations you are looking to get financial help from. The United States Trustee Program provides a list of credit counselling service that are approved to provide pre-bankruptcy counselling. This way you can talk to someone that can advise you whether or not to file bankruptcy. 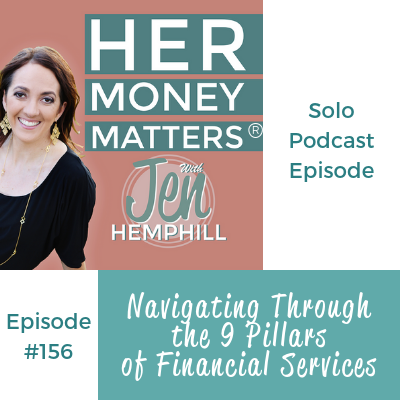 The post, HMM 156: Navigating Through the 9 Pillars of Financial Services appeared first on the Her Money Matters Podcast.